IT’s cricket once again and the black caps are already in India for a thrilling series. Even as Sourav Ganguly gears up to level the score of India’s disastrous series to New Zealand, he is all charged up for a new role — that of a cricket anchor. He is the first playing captain of India to simultaneously don the mantle of a TV show host. ESPN Cricket Show, Fridays at 9.30 p.m., will take a close look at what is happening in the world of cricket around the globe covering the issues on and off the ground both at international and national levels. Besides the interactive analysis, there’ll be a talent hunt contest, new Super Selector series and a host of interesting trivia to make the show a delight for cricket buffs. 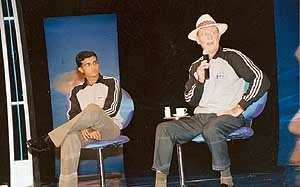 In the celebrated company of cricketing legends, Sir Geoffery Boycott, Sunil Gavaskar and the ever energetic Harsha Bhogle, Ganguly hopes his views will flow as freely as his cover drives. There’s no spice in life without an element of thrill and suspense. And happily there are still a few scriptwriters who still think beyond the 10-hanky soaps. Take for example Vikraal Aur Gabraal every Saturday at 7.30 on Star Plus. The series has struck the right chord with the viewers and its main protagonists Vikraal and Gabraal have become a rage like the earlier-day Shaktimaan. These two men in black are out on a mission to save planet earth from all kinds of evil. Their first encounter is with a mummy, which comes alive after being discovered. Now their next target is a cannibal—a la-Hannibal the Cannibal in Silence of the Lambs. Despite its very inspired-from-Hollywood themes, the series has gone down well with TV audiences thanks mainly to the taut scripts which prove yet again there is an eager viewership awaiting outside the ambit of the saas-bahu kitsch. Kagaar: Will it offset Karishma’s losses? Now with viewers giving an unambiguous thumbs down to the much hyped Karishma—the Miracle of Destiny, Sahara Entertainment suddenly finds itself on the back foot and is falling back on smaller serials to boost its flagging ratings. The channel is launching a slew of low-budget shows in a bid to offset the losses in the Rs 60-crore Karishma. 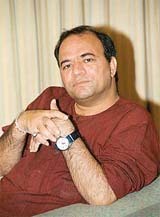 One such serial is Kagaar which was earlier aired on the channel and had bagged awards for the best thriller and best direction in 2002. Now the all-new Kagaar, being aired Monday to Thursday at 10.30 p.m., follows the time-tested theme of human emotions and how a lot of lives can be devastated when things go wrong. Given that the success of such themes is chancy, it is an edgy situation for Sahara Entertainment. What remains to be seen is whether Kagaar can weather the tough competition it faces from the omnipresent soaps. Not many serial-makers can create a lasting impact on their debut. But Chandrakant Dwivedi not just created an impact but a sensation with Chanakya. Even today, a decade later, he is still remembered for the serial that had viewers hooked not just because of his excellent direction but also for the powerful portrayal of the lead character. Though in 1996 he again bagged the best director award for Mrityunjay things had changed. 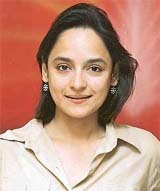 The serial flopped because, according to Dwivedi, "By then satellite channels had viewers in their thrall and all serious creativity on TV was rejected. It was the era of films, films and more films." Interestingly, Dwivedi has himself turned to films now. His new project Pinjar is based on a book by celebrated Punjabi writer Amrita Pritam. He has high expectations from the Manoj Bajpai and Urmila Matondkar-starrer revolving around the theme of Partition. "I found Pinjar as creatively satisfying as Chanakya but it’s difficult to predict its box-office success. Now it’s for the audiences to judge me once again," says Dwivedi. Even if the film doesn’t do well, he plans to continue doing serious project on the small and big screens. Though, he admits, "It’s very difficult to find finances for such films and serials in this era of Kaanta laga kind of entertainment." Though Fat and Happy on the National Geographic channel on October 17 at 8 p.m. is a programme about America’s latest epidemic—obesity—it could be set in any country, including urban India. While over 30 per cent of American adults are clinically obese, now 25 per cent of children too are tipping the scales at far higher weights than what is good for their ages. And the proportion is steadily increasing. What worries doctors is the shape Americans will be within a decade or so. The channel looks at research on fad diets; on the real relationships between activity and weight; on how well-meaning mothers teach their kids to overeat; on how obese research subjects bend the truth about what they eat; and on the growing tendency of many Americans, suffering from obesity-related diabetes, to get on to fad food diets. A well-researched programme that highlights the growing phenomenon of obesity and related diseases in a society brought up on junk food and colas. In the dynamic world of business where situations change in a flash, the key to success is information. India Business Report on BBC World in its new series Guide to Indian Cities every Sunday at 10 p.m. takes viewers to 12 of the most important business cities of India. The programme presented by Manvi Sinha provides comprehensive information about how business is conducted across urban India. It also gives viewers an insight on where businesses stand today, the future prospects and most importantly what defines the presence of Indian cities like Bangalore, Ludhiana, Surat, Delhi, Jaipur and Mumbai in the world of business. So, whether you are interested in stock markets or are a business person yourself, Guide To Indian Cities will take you on a 12-city tour Sunday after Sunday.